This grand statue at the junction of Hele Road and New North Road was unveiled on 6th September 1905, by the 3rd Earl Fortescue, Lord Lieutenant of Devon, with General Buller, his wife, Lady Audrey and daughter Georgina and thousands of people in attendance. To raise funds for the statue, 50,000 people subscribed towards its creation. The work of Captain Adrian Jones (1845-1938), a former vet and cavalry officer, the statue is a typical, although lively, bronze of the type produced in Victorian and Edwardian Britain. 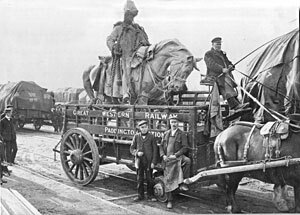 It was cast at a foundry at Thames Ditton before conveyance by cart to the Brentford Goods Yard and transportation to Exeter by a GWR train. Jones was also responsible for the four-horse chariot in bronze at Hyde Park Corner. The statue weighs 4½ tons and stands on a Cornish granite plinth on the site of what was known as the Edinburgh Tree - controversially for the people of Crediton, it faces away from the town, which some thought was a deliberate slight. The granite pedestal, carved by Messrs Pethick of Plymouth, weighs 35 tons and was a gift from Lord St Levan to commemorate the General's connection with Cornwall. 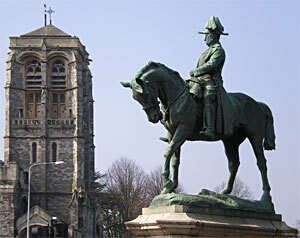 The statue depicts Buller astride his favourite horse, 'Biffen', while commanding his troops in South Africa. 'Biffen' and his other horse, 'Ironmonger' were both repatriated after the conflict. On the base is inscribed "He Saved Natal". A souvenir programme was issued at the time, for citizens to remember the event. The distinguished guests included the Lord Lieutenant of Devon, Viscount Ebrington, and mayors from other parts of the count. After assembling in the Guildhall they walked in procession to Bury Meadow with the 1st Rifle Volunteers providing a guard of honour. The statue was unveiled by the Lord Lieutenant who was standing in for Lord Wolseley an old friend of the general, who declined to attend due to illness. Viscount Ebrington hoped that the statue would remind future generations of the brilliant service of Devon's most illustrious son. The mayor described the statue as a magnificent gift and work of art to the city. The Exeter Oratorio Society and the city's male voice choir sang Land of Hope and Glory before the National Anthem played by the Band of the 4th Battalion Kings Royal Rifles brought the ceremony to an end. The bells were rung at Exeter Cathedral and the Band of the 4th Battalion, the Devonshire Regiment performed for the crowds in Northernhay Park, and later, the Belmont and St Thomas pleasure grounds. Tea was served in Bury Meadow for 500 army and navy veterans, many of whom had served with General Buller. Sir Redvers and Lady Buller and their daughter, Georgiana, were present at the unveiling of the statue, joined other guests at a reception and lunch in the Victoria Hall, Queen Street. In 1900, General Buller was presented with a sword of honour in a jewelled scabbard by the men and women of Devon for his exploits. It has been put on permanent loan by the Buller family to Exeter and is now part of the city's civic regalia. Born at Downes near Crediton, Buller was a prominent benefactor in Crediton and Exeter. The bronze statue, partly covered in sacking, on a GWR cart.